It’s great fun watching people learn new skills from scratch, literally how to put one foot in front of another, even when they are already famous or skilled in other areas. There’s not much practical help available on how to do service catalog, so there are a lot of ‘free style’ service catalogs being created out there. This service catalog webinar will provide real life practical guidance on setting up and running a service catalog. Where to start? What’s the value? What sort of documents do we need, who needs to be involved? How do we sell this to the organization? What are the issues we can expect? How do we overcome them? How would we identify and measure success? Where can we find more useful information? 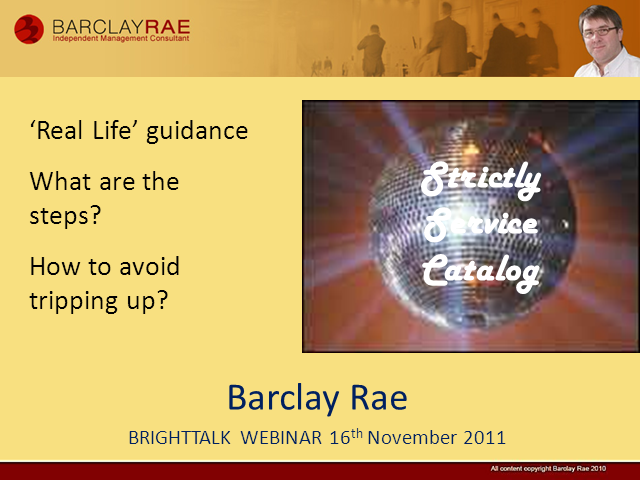 This session sets out the ‘how to’ for service catalog in simple steps with practical guidance from industry expert Barclay Rae, who has designed and implemented a number of service catalog projects over the years. The session is suitable for newcomers and those who are working to develop and implement service catalog projects alike.